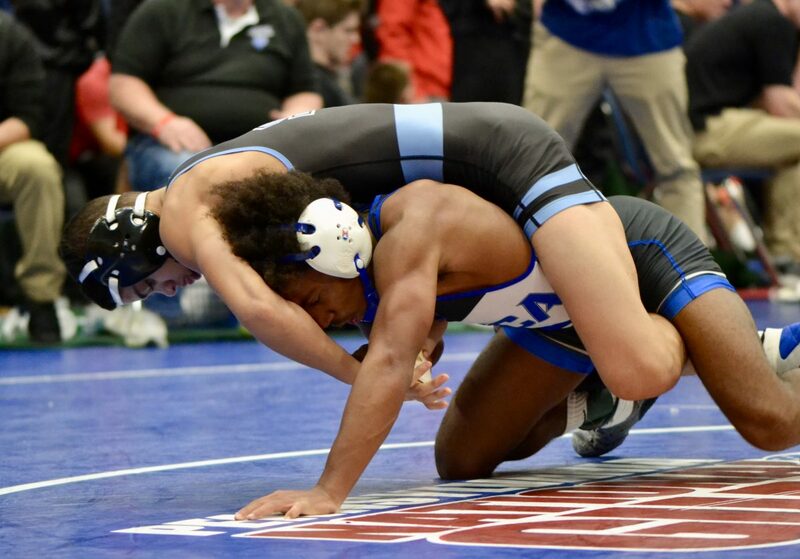 Cuyahoga Fall, Ohio – Pennsylvania saw 35 wrestlers advance into Day #2 of the Walsh Jesuit Ironman Tournament, 7 in the Championship Semifinals and 28 still alive in the consolations. Things got rolling right away at 106 lbs. and 113 lbs. where three of Pennsylvania’s seven semifinalists emerged. Last season Gary Steen went (2-2) at the Ironman but would go on to wins a PIAA Class 2A State Championship in March. This year, back at 106 lbs., Gary looks like a totally different wrestler as he picked up three falls en route to the Ironman Semifinals. Entering as the 6th seed Gary took a total of 0:20 seconds to pin the third seed Diego Sotelo of California and lock up a spot in the Championship semifinals against #2 seed Kyle Rowan of Ohio. After winning a Pennsylvania State Championship last season Alejandro Herrera-Rondon started to get some National attention. Well after Friday night he should be getting a closer look. The sophomore, seeded 10th, took out the 7th seed Dustin Norris (Ohio) in a tight (3-0) round of 16 bout. He followed that up with an exciting (3-0) decision over 2nd seed Jacob Decatur (Ohio) in the quarterfinals. He will face fellow Pennsylvania wrestler and 3rd seed Ryan Miller (Blair Academy). The Stroudsburg, PA native, who competes for powerhouse Blair Academy in New Jersey, won a sudden victory match over 6th seed Cooper Flynn (McDonough, MD) in the quarterfinals. PA Power Wrestling #1 ranked rookie Ryan Crookham (Notre Dame-Green Pond) proved why he is considered to be one of the best young prospects in the Nation as he rolled into the Ironman semifinals picking up a tech-fall, fall, and major decision at 120 lbs. on Friday. He will take on Ohio wrestler and 2nd seed Lucas Bryd in Saturday’s semifinals. Check out full results on TrackWrestling here and view all of Pennsylvania’s results below! Dante Frinzi (1-2) place is unknown and scored 6.0 team points. Trey Miletics (0-2) place is unknown and scored 0.0 team points. Nate Lackman (2-1) place is unknown and scored 5.0 team points. Dillon Murphy (1-2) place is unknown and scored 2.0 team points. Kenny Herrmann (2-1) place is unknown and scored 6.0 team points. Matt Lackman (3-0) placed 6th and scored 11.0 team points. Ryan Anderson (4-0) placed 6th and scored 16.0 team points. Cole Handlovic (3-1) place is unknown and scored 6.0 team points. Luca Frinzi (1-2) place is unknown and scored 2.0 team points. Henry Pavis (1-2) place is unknown and scored 2.0 team points. Joe Kurtz (1-1) place is unknown and scored 2.0 team points. Jarius Rosado (0-2) place is unknown and scored 0.0 team points. Jase Crouse (2-1) place is unknown and scored 4.0 team points. Ryan Miller (3-0) place is unknown and scored 11.0 team points. Michael Madara (2-1) place is unknown and scored 7.0 team points. Alex Cameron (0-2) place is unknown and scored 0.0 team points. Anthony Daiello (0-2) place is unknown and scored 0.0 team points. Brett Scalzo (1-2) place is unknown and scored 1.0 team points. Colby Duffy (1-2) place is unknown and scored 2.0 team points. Bryan Pensyl (0-2) place is unknown and scored 0.0 team points. Blake Daniel (0-2) place is unknown and scored 0.0 team points. Jayson Zinsmeister (0-2) place is unknown and scored 0.0 team points. Gaven Krazer (1-2) place is unknown and scored 4.0 team points. Isaiah Reinert (2-2) place is unknown and scored 5.0 team points. Dominic Falcone (0-2) place is unknown and scored 0.0 team points. Matthew Cruise (1-2) place is unknown and scored 1.0 team points. Andrew Balukas (0-2) place is unknown and scored 0.0 team points. Thayne Lawrence (2-1) place is unknown and scored 9.0 team points. Kyle Mathues (1-2) place is unknown and scored 4.0 team points. Dayton Delviscio (2-2) place is unknown and scored 3.0 team points. Jake Kroger (0-2) place is unknown and scored 0.0 team points. James Toal (0-2) place is unknown and scored 0.0 team points. Sidney Mathues (0-2) place is unknown and scored 0.0 team points. Dalton Harkins (2-2) place is unknown and scored 5.5 team points. Caden Rogers (1-2) place is unknown and scored 2.0 team points. Henry Hague (3-1) place is unknown and scored 7.0 team points. Nicholas Feldman (2-1) place is unknown and scored 5.0 team points. Owen Vietmeier (1-2) place is unknown and scored 3.0 team points. Nicholas Florschutz (1-2) place is unknown and scored 3.0 team points. Harry Stinger (1-2) place is unknown and scored 4.0 team points. Jack Wimmer (2-1) place is unknown and scored 4.0 team points. Cody Williams (1-1) place is unknown and scored 3.0 team points. Evan Maag (0-2) place is unknown and scored 0.0 team points. Joshua Bauman (1-2) place is unknown and scored 1.0 team points. Ryan Crookham (3-0) place is unknown and scored 15.5 team points. Brandan Chletsos (4-1) place is unknown and scored 9.0 team points. Richie Markulics (1-2) place is unknown and scored 4.0 team points. Nick Vonelli (3-2) place is unknown and scored 4.0 team points. Andrew Cerniglia (3-1) place is unknown and scored 6.5 team points. Derek Berlitz (0-2) place is unknown and scored 0.0 team points. Isaiah DeJesus (2-1) place is unknown and scored 7.0 team points. Eshan Swartz (1-1) place is unknown and scored 1.0 team points. Gary Steen (3-0) place is unknown and scored 17.0 team points. Cole Bayless (0-2) place is unknown and scored 0.0 team points. Beau Bayless (3-1) place is unknown and scored 10.0 team points. Andrew Ischo (2-2) place is unknown and scored 3.0 team points. Kaden Berger (1-2) place is unknown and scored 2.0 team points. Rocco Bartolo (2-1) place is unknown and scored 3.0 team points. Alex Ischo (0-2) place is unknown and scored 0.0 team points. Jordan DeCarmen (0-2) place is unknown and scored 0.0 team points. Hunter Thompson (0-2) place is unknown and scored 0.0 team points. Cole Toy (0-2) place is unknown and scored 0.0 team points. Mitchell Mason (0-2) place is unknown and scored 0.0 team points. Braydon Herbster (0-2) place is unknown and scored 0.0 team points. Wyatt Owen (2-1) place is unknown and scored 6.0 team points. Rocco John-Daniello (0-2) place is unknown and scored 0.0 team points. Amonn Ohl (1-2) place is unknown and scored 4.0 team points. Zack Witmer (2-2) place is unknown and scored 4.0 team points. Caleb Dowling (3-1) place is unknown and scored 6.0 team points. Keegan Rothrock (2-1) place is unknown and scored 8.5 team points. Tyler Stoltzfus (2-1) place is unknown and scored 6.0 team points. Zachary Rosenberger (0-2) place is unknown and scored 0.0 team points. Kolby Franklin (2-1) place is unknown and scored 4.0 team points. Dylan Chappell (2-1) place is unknown and scored 9.5 team points. Alejandro Herrera-Rondon (3-0) place is unknown and scored 12.5 team points. Ronan O`Shea (0-2) place is unknown and scored 0.0 team points. Chanz Shearer (1-2) place is unknown and scored 1.0 team points. Jason Geyer (2-2) place is unknown and scored 3.0 team points. Drew Vlasnik (1-2) place is unknown and scored 2.0 team points. Antonio Amelio (1-2) place is unknown and scored 1.0 team points. Nick Montalbano (0-2) place is unknown and scored 0.0 team points. Liam Volk-Klos (0-2) place is unknown and scored 0.0 team points. Sam Baic (0-2) place is unknown and scored 0.0 team points. Davin Beahm (0-2) place is unknown and scored 0.0 team points. Nick Funovits (1-2) place is unknown and scored 3.0 team points. Drew Munch (3-1) place is unknown and scored 8.0 team points. Beau Bartlett (3-1) place is unknown and scored 8.0 team points. Lincoln Heck (1-2) place is unknown and scored 2.0 team points. Connor Kievman (1-2) place is unknown and scored 4.0 team points. Jake Stefanowicz (3-1) place is unknown and scored 7.0 team points. Darrien Roberts (3-0) placed 6th and scored 12.5 team points. Mike Doggett (1-1) place is unknown and scored 4.0 team points. Nate Miller (1-1) place is unknown and scored 3.0 team points.